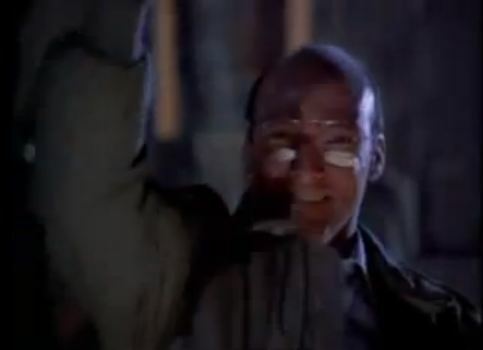 Ed Lauter, esteemed character actor whose name you probably never knew, who was such a good actor who has been known as Susan’s dad from “Real Genius,” Murray from “Youngblood,” or Mr. Kelly from “Gleaming the Cube”… he was even in “Automan” back in the day (but who wasn’t?). Mostly, he was that Militaryish Tough Guy With a Heart. The man was in 204 movies and TV shows. Seriously. But you and me, we know him as Janie’s Dad. He’s OK with her sneaking out of the house as long as it’s in pursuit of a job. In his honor, I invite you to re-read my first-ever SlumberPartyMovies post, entitled “Slow, Slow, Quick-Quick Slow,” a treatise on why Girls Just Wanna Have Fun was the greatest 80s teen movie. If you don’t have time for that, just watch this. Aw, Dad. This entry was posted in Dearly Departed, Girls Just Wanna Have Fun and tagged dearly departed, ed lautner, girls just wanna have fun. Bookmark the permalink.